TAMPA, Fla. - Oct. 23, 2017 - PRLog -- Spinetingler Magazine announces that it will begin regular publication of a print magazine. The long-running ezine will continue to publish web content between print issues. The first issue will be published in November 2017 by Down & Out Books. "As is true in life, the events of the past have a tendency to influence our actions in the future," said Sandra Ruttan, co-editor of Spinetingler Magazine. "It is the support of our readers that has enabled us to return with this print edition. With their continued support we hope to be able to continue to bring exceptional short fiction and features to you for years to come." "I am a life-long fan of short crime fiction," said Eric Campbell, publisher of Down & Out Books. "And when Sandra and Jack Getze, her co-editor, approached me about putting out a print edition of Spinetingler Magazine, I didn't hesitate. The variety of features and quality of stories is exceptional." 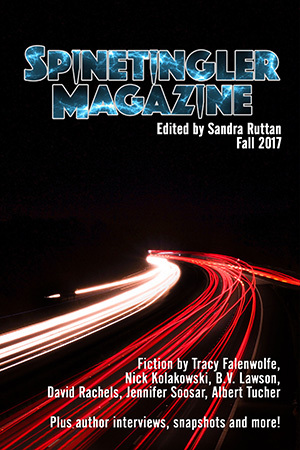 The Fall 2017 edition of Spinetingler Magazine will feature original stories by Tracy Falenwolfe, Karen Montin, Jennifer Soosar, BV Lawson, Nick Kolakowski, David Rachels, and more. There are author snapshots of Con Lehane, Rusty Barnes, Mindy Tarquini, and others. Book features and reviews fill out the magazine's pages. About Spinetingler Magazine: Founded in 2005 by K. Robert Einarson and Sandra Ruttan, the ezine (spinetinglermag.com) was later acquired by Jack Getze and transitioned to an ongoing publication format online. About Down & Out Books: Celebrating six years as an independent publisher of award-winning literary and crime fiction, Down & Out Books (https://downandoutbooks.com) is based in Tampa, Florida. For more information about the magazine, or to request an interview with the editors or publisher, contact lance@downandoutbooks.com.